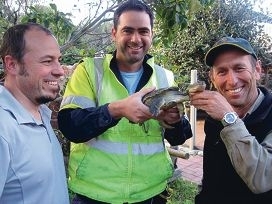 Murdoch University’s Peter Adams, Tronox’s James Owens and Department of Parks and Wildlife’s Robert Huston with a long-necked turtle. Murdoch University honours student Stuart Dawson undertook research to prove red foxes are the number one predator of the turtles. The project involved placing and monitoring 580 artificial long necked turtle nests across the reserve. Peter Adams, of Murdoch University, said more than 40 per cent of the artificial nests were predated by foxes over a one-year period, with 68 per cent of predations occurring within 30 days. ‘While those nests containing eggs were most often predated, nests which did not contain eggs or turtle scented water were still dug up by foxes,’ Dr Adams said. Department of Parks and Wildlife Perth Hills District’s Nature Conservation Program leader Bob Huston said motion sensor infrared cameras were used to capture the foxes in action. Fox DNA was found on shell and turtle remains collected at the reserve. ‘The results of the research have confirmed that the female long necked turtles are being eaten before they have lived a full life of breeding potential,’ he said. Mr Huston said phase two of the research project would look at testing caged nesting enclosures.